As a parent of a child with autism, I often wish I could understand how my son sees the world. There are differences and if I understood them more I could not only help NHL at home, but communicate this to others that work with him on a daily basis at school. For years before we had answers and our diagnosis, I struggled. The level of frustration for both NHL and me was clear and it hurt not knowing how to help my own child. The reality is that I can’t beat myself up because I simply did not understand and TechyDad and I searched high and low for medical professionals to give us more answers. Once we knew that we had an Aspie, we regrouped and started to parent differently. Each day, we put one foot in front of the other and take it one moment at a time. As I noted the other day, sometimes you just need to laugh or you will cry. Several weeks ago, I remember seeing Jon Stewart mention a book that was flying off the shelves that he adored. Then my mother mentioned a post from my cousin on Facebook. Both were referencing the same book, The Reason I Jump by Naoki Higashida and introduction by David Mitchell. When I read that it was written by a 13 year old boy and was his inner voice as a child with autism, I knew that I had to read it. I picked up the book at our local library the other day, but I have to tell you that I will be buying a copy. While I have not finished the book just yet, it is phenomenal. 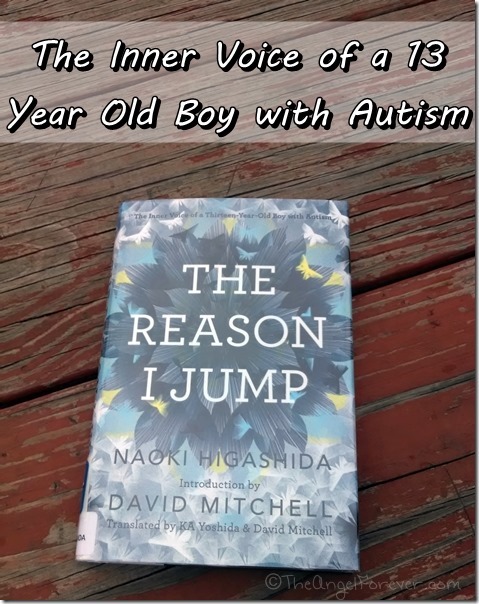 The introduction alone is a power house and then you begin reading the translation of this amazing young Japanese boy with autism. His words hit me hard. My son is just a few years younger than he is. I can imagine in time that these may be thoughts in his mind. More than anything, I stopped to think about our life, things that happen here, and how these words could be used. I envisioned making reminder cards for people and suggesting to some to read this rather short and powerful book. Higashida answers questions throughout the book like Q13 Do you prefer to be on your own? My heart broke reading his answer. Anxiety and knowing that things usually go wrong in social situations often make him (and likely my son) stay to themselves. Rather than be flustered, worry about what others think (causing them trouble as he says), and not knowing how to respond in a social situation they often end up on their own. Here is part one of interview that Jon Stewart had with David Mitchell on The Daily Show that will give you a taste of what the book is really about. As you can see, so many myths of autism are crushed thanks to this one amazing child. The level of empathy he has reminds me of my son and I have to admit I now worry that he sees too much in my world as an autism advocate. Forgive me for cutting this short, I am off to finish reading because I do believe there will be much more to share soon. I encourage everyone to take some time to read this book because it is a life changing book. in roots in Japan with Dr. Kiyo Kitahara and what this young man expresses is something we have know for some time. visit our school to see how we help these children and their families reach beyond expectations.